Armed with the two spindles, and knowing from experience it’s easier to ply them on the wheel, I opted for the inconvenience of removing the bobbin of blue yarn I’m currently spinning so I could get my art yarn plied, set, and played with! 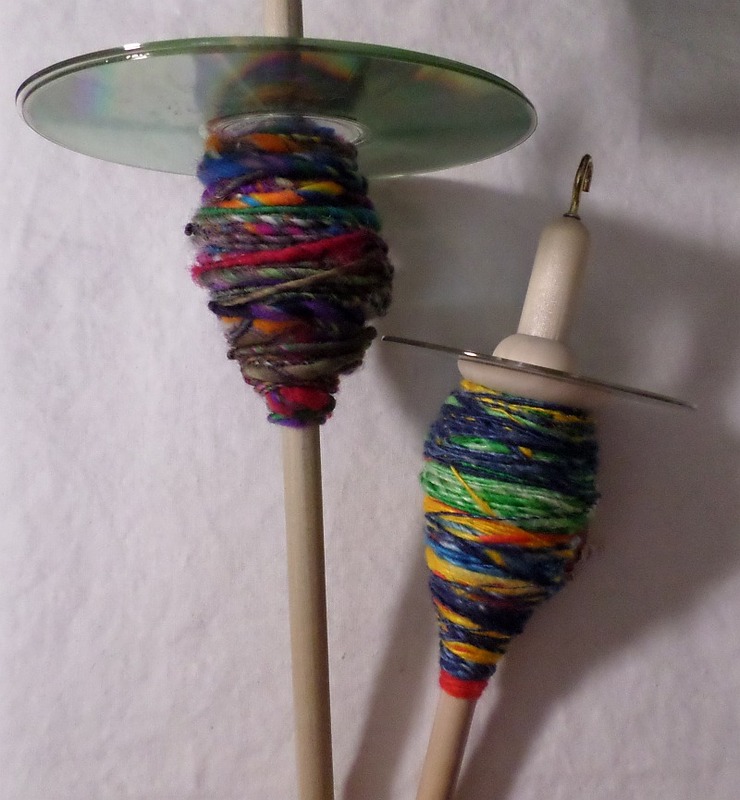 Except for the difficulty that arose from SEVERAL intensely over-spun areas, the plying went quickly. I’m excited to unwind the bobbin, but I need to wait at least overnight. I hope it will look good. From what I see on the bobbin, I think it will. A friend (Cheryl K) from the Facebook Pin Loom Weaving Support Group sent me several small samples of art yarn she’d spun (which is what ignited my interest) a year or so ago. 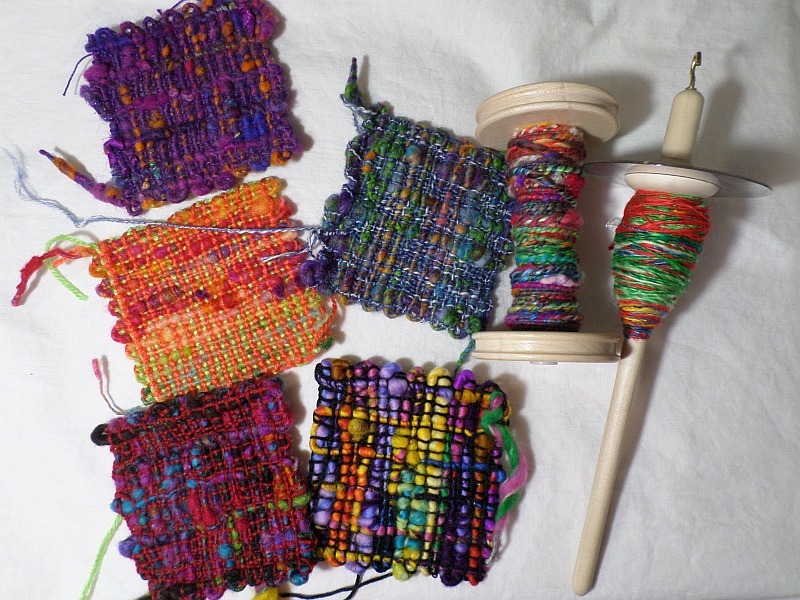 I spun my first art yarn then, entirely on the wheel (the very bright square, bottom center). As I recall, it was a sort of mad romp (which is probably why Impatience whispered to me to try a different method this time). 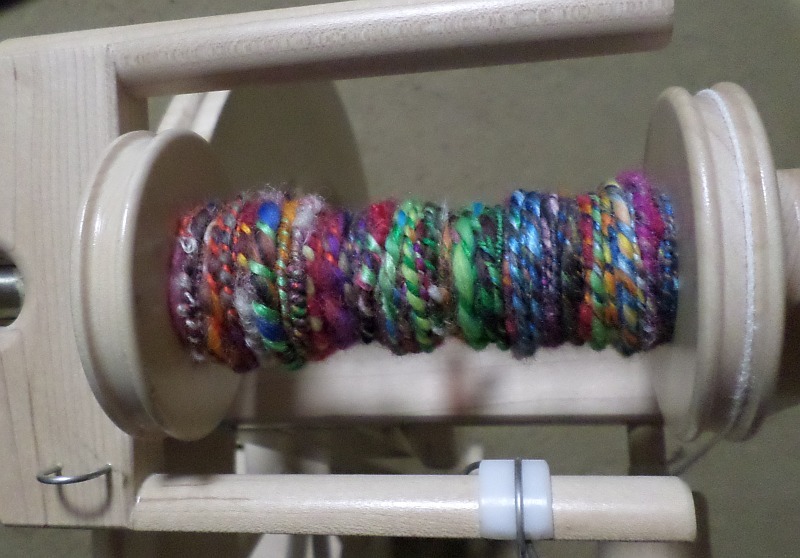 Spinning art yarn is—so far, in my opinion—time consuming, materials consuming, not high-yield, and not especially fun. So why try? Well, I like a challenge and I LOVE the results. I have dreams of accumulating a whole bunch of little art yarn squares and . . . Doing SOMETHING grand with them. Or maybe I’ll just keep looking at them—because that’s fun and convenient and fast.